Then he brought me back to the entrance of the temple; there, water was flowing from below the threshold of the temple toward the east (for the temple faced east); and the water was flowing down from below the south end of the threshold of the temple, south of the altar. Then he brought me out by way of the north gate, and led me around on the outside to the outer gate that faces toward the east; and the water was coming out on the south side. Wherever the river goes, every living creature that swarms will live, and there will be very many fish, once these waters reach there. It will become fresh; and everything will live where the river goes. In the temple he found people selling cattle, sheep, and doves, and the money changers seated at their tables. Making a whip of cords, he drove all of them out of the temple, both the sheep and the cattle. 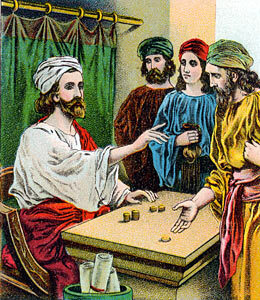 He also poured out the coins of the money changers and overturned their tables. He told those who were selling the doves, “Take these things out of here! Stop making my Father’s house a marketplace!” His disciples remembered that it was written, “Zeal for your house will consume me.” The Jews then said to him, “What sign can you show us for doing this?” Jesus answered them, “Destroy this temple, and in three days I will raise it up.” The Jews then said, “This temple has been under construction for forty-six years, and will you raise it up in three days?” But he was speaking of the temple of his body. In the time of their visitation they will shine forth, and will run like sparks through the stubble. They will govern nations and rule over peoples, and the Lord will reign over them forever.Those who trust in him will understand truth, and the faithful will abide with him in love, because grace and mercy are upon his holy ones, and he watches over his elect.